Hello generous, awesome CLIFF supporters! I am so sorry for the delay in getting this update out to you- thank you so much for everyone’s patience. I have come to realize making a documentary is like remodeling a house—everything takes a lot longer than you think! So…after weeks of saying the film was two weeks from completion, we are finally there (well…almost…still a few minor tweaks :)! Starting today I will begin to enter “Cliff, Superfan” into some targeted film fests. My hope is to get it before some audiences especially in the California area and here in Chicago. Due to NCAA rules, the film can’t show until late fall, so I’m shooting for fests that will run at that time or after. Meanwhile, I am also looking into the best ways to share the film with you all so that you can watch as soon as the film makes its first fest appearance. I am so excited that Cliff will be visiting Chicago next week for a book fair. It will be great to see him, plus he will be able to autograph some of the last “perks” that I owe to supporters. Speaking of perks, thanks to those who sent me pics of them wearing another perk- the “Cliff, Superfan” tee! From the east coast to the west- you all are looking good and some extra exposure never hurt 🙂 !! Ben on the east coast! Nick and Divya’s son in the Midwest! Taylor and fam on the west coast! Making this short doc would NEVER have been possible without your support (both emotional and financial!). I know my son, Chris, is smiling…he taught me what it means to not be afraid to take risks and to follow your passion. THANK YOU from the bottom of my heart!!! As Cliff would say when he finds an archival document waiting for him in his P.O. Box or when he sees a crafty player scoring a goal….WOW!…WOW! THANK YOU everyone for helping me surpass my goal of $8000 –and we were just dollars away from reaching my second stretch goal of $20K! I know I have said this often, but I am truly overwhelmed by everyone’s generosity and support. Whether it was by donating or sharing the link, I could not have reached my goal without you! Two weeks ago I spent another 5 days with Cliff shooting some more footage. (He sure is hard to keep up with!) I continue to learn more about him and I look forward to sharing his story with you all. 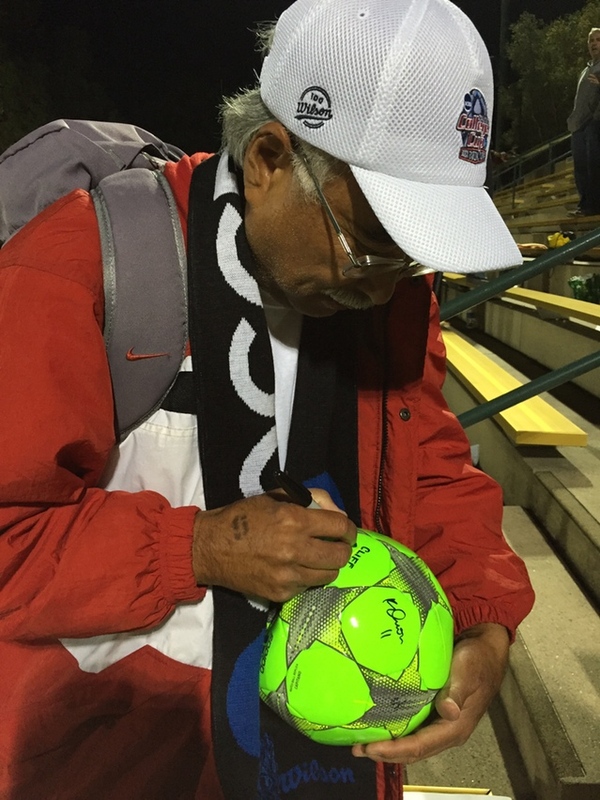 Here’s a picture of Cliff signing one of the Kickstarter “rewards”- a ball autographed by many different Stanford soccer players. Cliff told me he has designed a new autograph. He’s now signing his last name in Japanese. “Hayashi” means “trees” in Japanese…and wouldn’t you know it? Stanford’s band mascot is the tree! Anyways… I digress!!! THANKS again to all from the bottom of my heart! First stretch goal met! Thank you! New Stretch Goal – $20K!! So excited to announce that the first stretch goal of $15K has now been reached! So many of you have helped either by giving or spreading the news- and I can’t thank you enough! With a new stretch goal of $20K, I am hoping to cover all the editing costs (FYI-total budget for the film is $29K)! So…if you haven’t donated and would like to, we would love to have you as a backer. 🙂 Otherwise sharing this link is also very appreciated! I am on my way back to San Francisco next week to get some more footage. Will be sure to include a few photos in my next update. Until then, THANK YOU!!! !